Sometimes beauty is the enemy. How to prevent ice dams from forming and causing damage to your home. - Scarsdale Premier Insurance Agency | Advocate Brokerage Corp. Sometimes beauty is the enemy. How to prevent ice dams from forming and causing damage to your home. There is no doubt that as snow begins to fall, our homes look beautiful blanketed in snow. Once the icicles begin to form, we will often stop to admire their beauty. Unfortunately, sometimes beauty is the enemy and can cause damage to your home. An ice dam formed on the edge of your roof can tear off your gutters, loosen your shingles and cause leaks in your attic and walls. 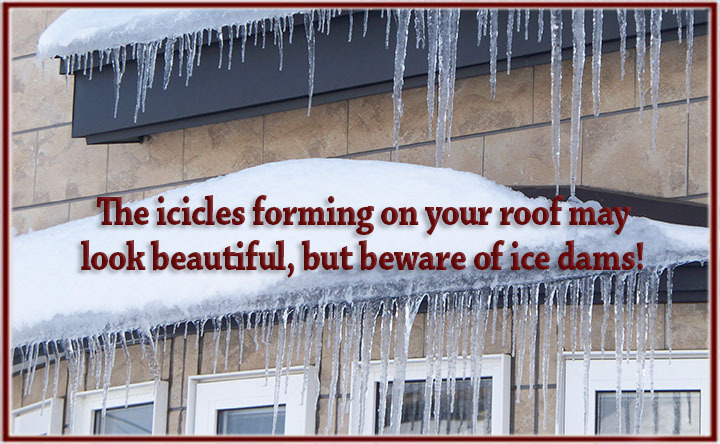 An ice dam is a solid formation of ice at the edge of your roof that prevents melting snow to run off your roof, into your gutter system to be safely run off away from the foundation of your home. The heat from inside your home naturally rises to your attic. As it reaches the roof, it warms the underside of the roof. The cold air on the outside of your home causes the snow that accumulates closer to the eaves of your home to freeze. The frozen ice at the edge of your roof and on the eaves becomes a thick layer of ice which is called an ice dam. 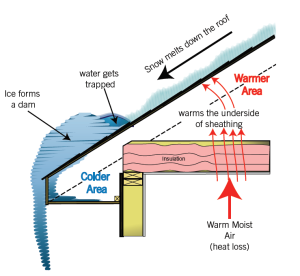 When the snow on the warmer upper section of your roof begins to melt, the water has nowhere to run off, and so it backs up to the underside of your roof which is where all the trouble begins! What can I do to prevent Ice Dams before they form? Insulate the attic floor well to minimize the amount of heat that rises into the space. Keep the attic well ventilated so that the cold air outside can circulate through it and reduce the temperature of the roof system. The idea is to keep the attic colder so there is less thawing and refreezing on your roof. If heavy snow and ice have already formed in thick layers on your roof and you suspect an ice dam has formed, check for leaks. If you suspect water damage, it may be time to call in a professional for help. Your safety is what is most important! Although snow removal will help with ice dam prevention, if you cannot safely reach the snow, don’t try to remove it yourself! Attempt snow removal if it will push against the grain of the roof shingles. As your Advocate, we are here for you. Providing you with valuable information that helps you prevent ice dams from causing harm to the roof of your home is important. Unfortunately sometimes, no matter how much preparation we put in, damage happens. Either way, we’ll be here!